In July 2017 the new annual award cycle regime was put into effect for Microsoft MVP’s around the world. Earlier this year, to simplify the process and introduce new talent in the program more quickly, Microsoft switched to a monthly cycle for recognizing MVP’s, and changed the award review from a quarterly to an annual cycle. This meant MVP’s from April and July were going to be the first ones the be reviewed for June 2017; the January and October awardees got their review shifted to July 2018. That might look like dispensation, but it isn’t as their contributions will be evaluated over a longer period of time. Looking at the publicly available statistics on MVP’s around the world could provide some insight in what the program – and thus Microsoft – has set their sights on. So with the introduction of the new cycle, I did a quick comparison of this and last month’s numbers. But first a small disclaimer: below numbers are taken from a public source, the Microsoft Valuable Professional portal. Also, there are a small number of anonymous MVP’s, which always puzzles me as being an MVP usually means that this person is visible online. And finally, note that MVP’s can be awarded in more than one category, which is the reason some numbers won’t add up. Overall, the numbers are down except for the new AI category and the number of Outlook and PowerPoint MVP’s. Looking at the names that were not on the MVP portal per July, one may notice there are quite a number of long-standing MVP’s that were not re-awarded. Apart from being a big loss for the community, it is also an indication Microsoft is further looking ahead to the Cloud First, Mobile First, On First™ world, indiscriminately coming clean with the MVP population in the process. For those that were not re-awarded, thank you for all your past contribution, some for being an inspiration long before I became one, your honest feedback to the program and other MVP’s. Don’t forget: Once an MVP, always an MVP! 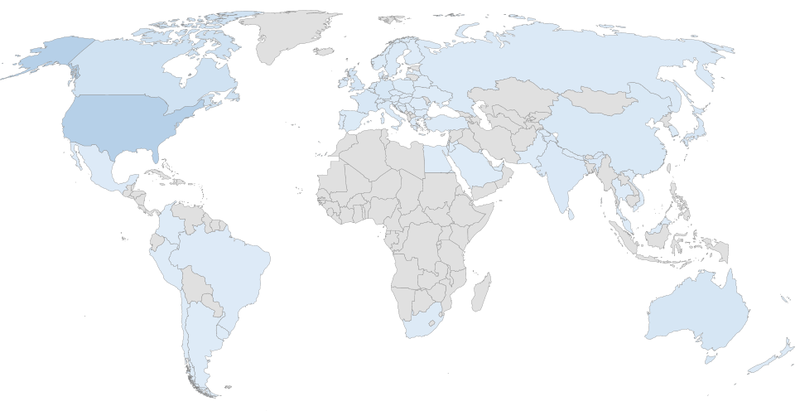 It’s been a while since I made an overview of the number of Exchange MVPs around the world. With the recent reorganization of the MVP program, lots of product-related MVP awards were merged in container titles. For example, the former Exchange or Lync Server MVPs are now part of the Office Servers and Services MVP, making it nearly impossible to differentiate per expertise unless classifying individual MVPs. 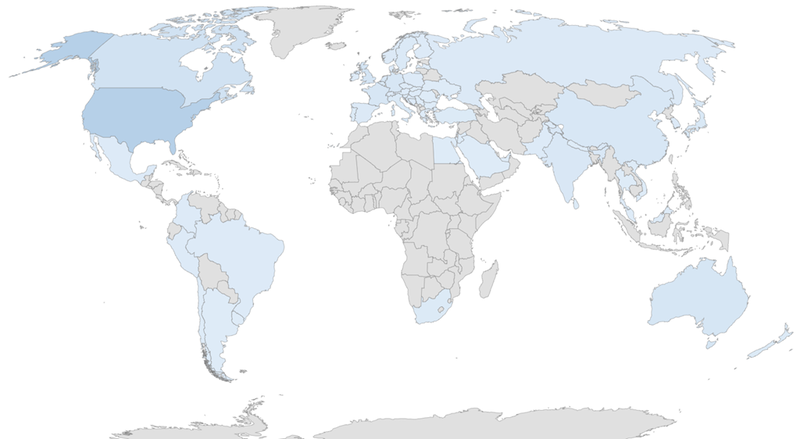 The graphic displays distribution of Office Servers and Services MVPs over the world, per October 2016. The information is collected from the public MVP site, and while some MVPs remain anonymous (curious, as awardees are in principle active community members), it’s clear some regions are still under-represented. Below are the numbers used to create the above map. In april, I did a heat map of all the Exchange MVPs in the world. 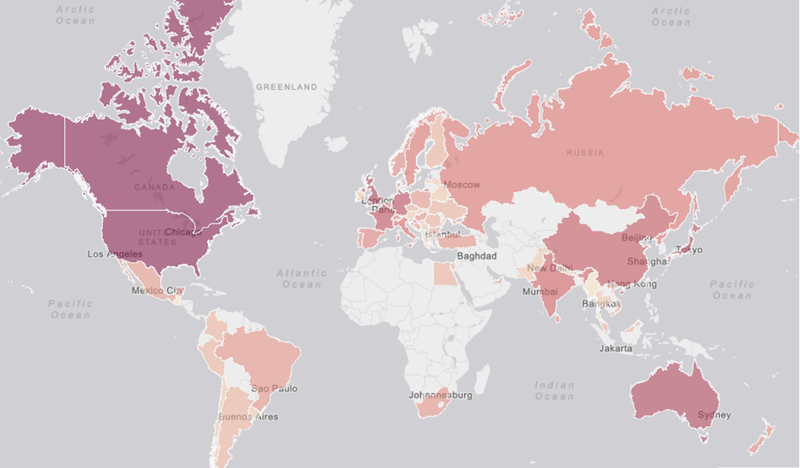 After several months, it’s time to update this map to reflect the latest changes in the Exchange MVP population. Here is the list of countries with changes in number of Exchange MVPs compared to April: Argentina (0->1), Bermuda (1->0), Canada (6->5), China (12->13), France (3->5), Lithuania (0->1), Mexico (0->2), Russia (5->6), Singapore (1->0), Sweden (3->4), Taiwan (1->0), Thailand (1->0) and Turkey (1->2). If there are any inaccuracies, please report them in the comments below. 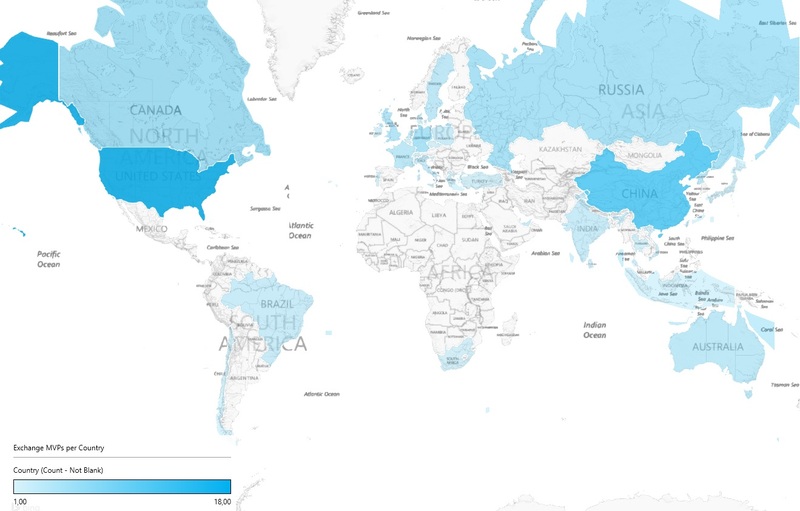 After checking the heat map of current Lync MVPs by Fabrizio Voipe, I was curious about the current geographical distribution of the Exchange MVPs. MVP awards are given to individuals by Microsoft in recognition of their contributions to the technical community. There are little public statistics available, so I had to resort to information from the MVP site. Note that MVPs may decide not to be visible here, but looking at why people get an MVP award, I figured going in hiding isn’t one of their characteristics, thus expecting the number of non-listed MVPs to be negligible. A little playing around with Excel and Power Map gave me the following geographical map. Not surprisingly, the major suppliers of Exchange MVPs are the United States and China. For reference, I have included the mapped numbers in the table below. Please let me know if you want to share corrections or have any updates.